Until now, Temple Church in London has avoided the gaze of the Templar Mechanics study. With countries going bust and austerity measures to come for all....I decided this was the perfect time to cast my eye over one of the most influential areas on the planet to see what might lie beneath it all. I was curious as to what geometry might lie within the area known as ‘Inner city London’ and how the Templar’s Temple church might fall in. The other Inner city states are situated in Italy, Vatican City state...and Washington DC...known as District of Columbia. London - City State - Financial. These independent city states are detached from the hosting country and have their own laws , courts, flags, police and systems of taxation....they exist as a little country within a larger hosting country. 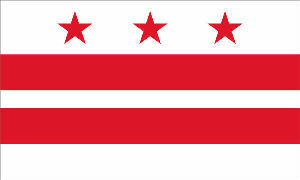 The flag for the District of Columbia shows three stars each representing one of the three Inner City States in the group. Each of the three City States also have an obelisk . The 3 City States work together to imprison the individual through the three major disciplines of social control.......religion, military and finance. Military – Ultimately exists as the private army of the ‘Globalist banking cartels’ that create / manipulate wars for profit, resource theft and population control. This has been going on for as long as people have been putting on a uniform, and includes WW I and the sequel WWII . Move to arms is sold to the public as patriotism... both are then thrown in washer and spun through media indoctrination cycle set at 60 degrees....by the time the individual reappears from the spin cycle, dazed and indoctrinated, the ‘patriot’ will pretty much do whatever it is told to do ...including shooting people it has never met or doesn’t know...simply because ‘patriot’ is told to, this is reinforced by a good dose of perceived and often ongoing threat to the homeland, regardless of whether it exists or not....If you do not go along with the war you are a traitor and seen as unpatriotic for not backing the slaughter. Finance – Used to enslave society through debt. National banks print ‘debt money’ which has to be returned to the National Bank with interest paid. The money to pay the interest is never printed, as any money issued by the central back is always due back with interest. Only the ‘principal’ ever exists in circulation... So there will always be more money owed to the Banksters than exists in circulation. .......Hence defaults, recessions are built into the monetary system creating winners and losers.....like a game of musical chairs someone is left without a chair when the financial music stops ( recession through money contraction ). Any of the above can enslave the soul (spirit in residence) to servitude of one type or another.....But like a good movie there’s a twist in the tale at the end and all hankies can be put away. By realising what these three institutions really are allows you the option to make a different choice....to step out of the shadow and shine. Which ultimately is why were here, why we’re in the polarity game and why we volunteered to come down and wallow in this mess....to show what we really are. ...to shine by saying ...Enough! To know what is right and wrong birthed from your heart, not what some lieing, ‘pre bought’ hypocritical politician tells you is right and wrong. Question: Is it right to bomb a country and its population back into the stoneage based on a false flag event (9/11) created elsewhere so a select group of globalist / banking cartels can create a war for monetary profit and resource theft ? If you think NO !...then it’s time to voice that opinion.....For the sake of your children and the next generation . Within the pillar / obelisk / tower is said to reside the spirit of Amen or the male seeding influence, these obelisk type structures are often strategically placed within a geometric configuration of notable local points ....as you will see Londons ‘Big Ben’ follows the same pattern ...being sited at the ‘crotch’ point of the London Pentacle . In Washington DC the obelisk has been set within a Vesica Piscis arrangement of circles. 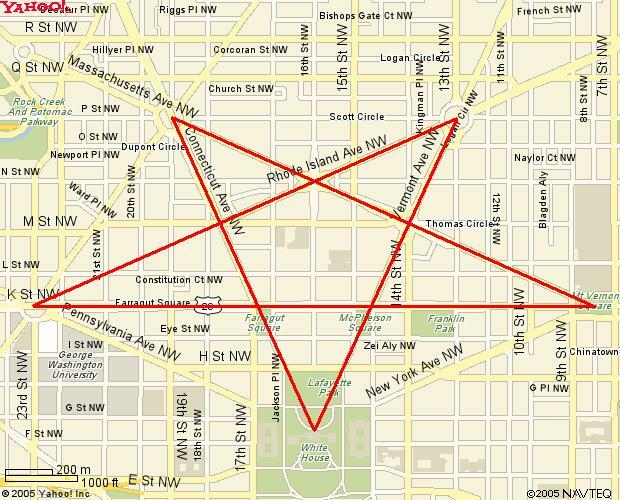 Washington DC also has a pentacle inherent in its design one arm of which points into the Whitehouse. The Vatican obelisk is set within an oval with 8 points . 4 lines pass through the obelisk, which also sits within an inner circle, creating an 8 pointed star effect. With this in mind I pondered the layout of the London Inner City state. I was curious as to what geometry might lie within the area and how the Templar’s Temple church, which is situated within the London Inner City state, might fall in. Other researchers such as Chris Street have done a comprehensive study of the London area and noted holistic sites being complimentary to an ‘Earthstar’ pattern resonant to the works of John Michell complete with sacred numerical values and ratios. Earthstars – ISBN 0-9515967-1-3.....nice to see the 515 manifesting in there. London is a big place and to undertake a project like Chris did is some achievement. My interest though was in the geometry that may lie within the ‘Inner City’ area. Having an interest in energy and the resulting manifestations I pondered what geometry may be present in what is one of the most influential (finance) areas on the planet. Two people in tune with the land may see different grids or layers within.....This is not to say one is wrong ...In truth there may be several levels of geometry working in an area....often landscape geometry from different intuitive human sources turn out to be complimentary....with the same agreed upon points being significant. It’s for this reason I would never dismiss anyone’s thoughts on ‘what’s there’....even if I may not be picking up what they are picking up on...trick is to communicate and learn. Ego cannot survive long in the land of the geomancer....being humble and approaching an area with a child like sense of awe and wonder will take you far...the universe seems to like this approach and responds well to it. To a child the world is a new and magical place, they see things with fresh eyes every time they look, without preconceived views as to how things are or how they should be...It’s when the social programming kicks in that we lose that innocence...that sense of awe and wonder and the drab grey cloud appears of preconceived expectation ....slaying the ‘what if’ magic as it encroaches on our point of observation....telling us what society expects us to see...and of course what not to see...or else be threatened with being outcast from the social group...Thankfully I am now beyond that with Templar Mechanics and past caring. If Mechanics doesn’t resonate with you walk away,....I’m not out to preach a belief system, I’m just sharing what I see when looking past and through the social / dimensional filters. Dance of light and dark........Mixed messages of the polarity drama. As stated on the welcome page of Templar Mechanics ... I believe the Templars were aware of Earth energy grids and the connection between power, influence and location hence they set up commanderies around earth energy power points to utilise / tap into and empower their own agenda. Whether you wish to see that as positive or negative is up to you. Truth is both exist at the site...and both have their use within the greater whole and grand design.....people see what they have access to based on their dimensional vision. It’s worth remembering that this ‘life/ planetary gig’ is not over till the fat lady sings.......and what can appear as ‘negative’ or ‘conspiracy’ in one moment of illusory time may look very different come the final whistle. Source plays hide and seek with itself through light and dark energies. Light and dark energies create the interplay for experience on the material plane. Before rushing to condemn aspects of sources creation as negative, as hard as it is, we should remember all is subjective and that all is Source. Earth is no more than a grain of sand on a beach when compared to vastness of the cosmos and everything else out there. There’s more going on with the bigger picture than our ‘Earthly Dramas’....however important they may appear to us in our insular physical world as we ‘look in’ missing 95% of the jigsaw puzzle through the limited filter of the 5 senses. A Gem in the Dark. How often have we been in a dire situation only to look back at the event in the future to see it was the making of what we are today.....There was a diamond in the lump of coal which was only revealed when it broke into two parts years later to reveal itself....This is the ‘coal role’ the dark plays...it sets the stage for the light to shine, if the light doesn’t shine another stage is created , then another until it does...so indirectly the dark serves the light. I have noticed that humans in extreme conditions and under extreme provocation reach reserves they never knew were there....They surprise themselves as to ‘what’s within’...they discover the light within...which is the whole purpose of the construct / game and the interplay between light and dark. With all this in mind now lets have a look at the geometry of the Inner city state of London....Which for many will hold dark influences, which can’t be denied.....on one level. Best tool for a dark place is a torch so let’s shine it on Inner City London and see what really underpins the ‘lair’ of the corrupt Bankster money cartels and parliamentary administrations. ...and see if it’s possible to manifest something else from the underlying geometry. The London penta revelation is in line with the movement towards truth, the unfolding bigger picture and the unstoppable revolution towards the awakening global consciousness as to what we truly are, Spirit in residence.